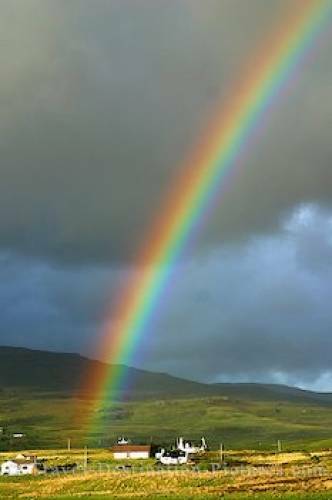 A beautiful rainbow contrasts with the dark thunder clouds in the Isle of Skye, Scotland, Europe. While the frequent rain on the Isle of Skye can be annoying, it also provides lots of occasions to catch beautiful sights of the rainbows which are produced by the rare sunshine spots. Isle of Skye, Scotland, Europe.